Ravali Gummi spoke about the Kansas City Free Eye Clinic during the opening session of the 2017 Clinton Global Initiative University. Volunteers with the student-operated Kansas City Free Eye Clinic (KCFEC) are working to extend free eye care to the city’s refugee community. 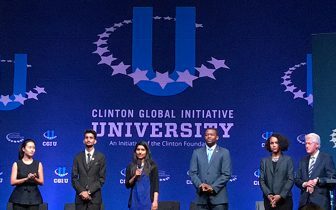 The plan took a national stage in October when Ravali Gummi, a sixth-year medical student at UMKC, pitched the idea to more than 1,200 college students from across the globe and national leaders at the Clinton Global Initiative University. The annual meeting is an event of the Clinton Foundation that brings together young visionaries from across the globe to discuss and explore global challenges. 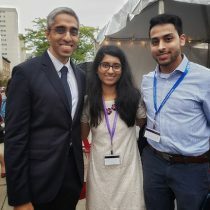 Ravali Gummi, middle, and Imran Nizamuddin, right, met with Dr. Vivek Murthy, the 19th Surgeon General of the United States, at the Clinton Global Initiative University. Gummi serves as student clinic director of the KCFEC. Imran Nizamuddin, a fifth-year medical student, is the organization’s communications director. Both were invited to attend this year’s Clinton Global Initiative University in Boston based on a Commitment to Action plan submitted on behalf of the KCFEC. In addition to being selected to attend the national meeting, their action plan, “A Vision for Our Refugees: The Efforts of a Free Eye Clinic,” was one of just five chosen for presentation on the main stage during the meeting’s opening session. After making her presentation (that begins at 37:35 of the video), Gummi had the honor of shaking hands with former President Bill Clinton. “The opportunity to speak on stage prompted many conversations through the rest of the weekend, as students approached us to ask more about our free eye clinic or to share their own efforts,” Gummi said. In her presentation, Gummi explained how the KCFEC has treated more than 3,100 patients and distributed more than 1,000 pairs of free eye glasses since its inception eight years ago. Five years ago, the clinic moved to a location densely populated with homeless shelters to target local underserved populations. “This year, we are seeking to reach the increasing number of refugees entering the Kansas City area and enhance their access to eye health care,” Gummi said. During the Clinton Global Initiative University program, Gummi and Nizamuddin networked with other students, met with national leaders and learned about the diverse array of global challenges facing the world. In 2009, KCFEC began in part as a commitment from Clinton Global Initiative University with a grant from the foundation. 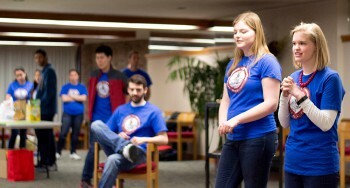 About 30 volunteers, including UMKC medical and physician assistant students, and Kansas City University of Medicine and Biosciences students, actively participate in the KCFEC. In addition to the initiative to expand eye care to the refugee community, Gummi said the clinic is working toward starting a new mobile eye clinic to better serve patients for whom transportation is a barrier. 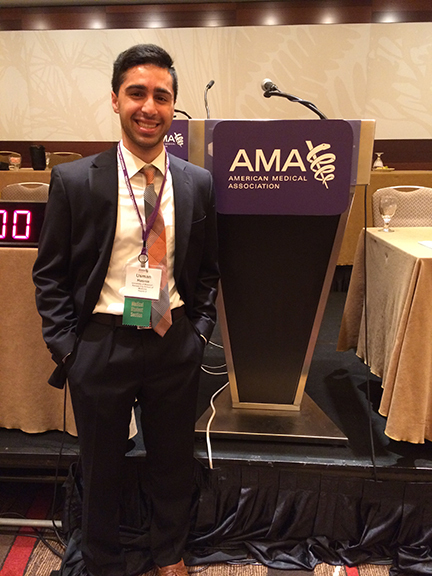 Usman Hasnie was appointed to the AMA Medical Student Section Committee on Global and Public Health at the 2017 AMA annual conference in Chicago. Usman Hasnie knows well the importance of clean and adequate water supplies. As a high school student, he saw it first-hand while serving in Pakistan as a volunteer with SOS Children’s Village, an organization that provides care and resources to abandoned, destitute and orphaned children. Hasnie is also from Flint, Michigan, and watched as a water crisis has thrown that community into a state of chaos for the past three years. The images of both have prompted Hasnie to seek ways to make a difference. His latest effort will be as a member of the American Medical Association Medical Student Section Committee on Global and Public Health. He was selected to be part of the committee at the AMA national meeting in June. Hasnie joined the AMA’s student section two years ago. “The American Medical Association was an opportunity to advocate for my patients and to be part of the nation’s largest and most influential physician organization striving to increase access to healthcare for everyone,” he said. Last year, Hasnie served on the student section’s committee on Long Range Planning. Now, he will serve a one-year term with 13 other medical students from across the country working to educate the AMA on public health topics and to organize public health initiatives. Some of the agenda items for the year are providing educational programming at the AMA interim and annual conferences, and creating a campaign for National Public Health Week in April 2018. At the same time, Hasnie hasn’t forgotten the people of Flint or the children in Pakistan. He said he plans to focus some of his committee’s attention on the Flint Water Crisis, firearm violence and water sanitation. 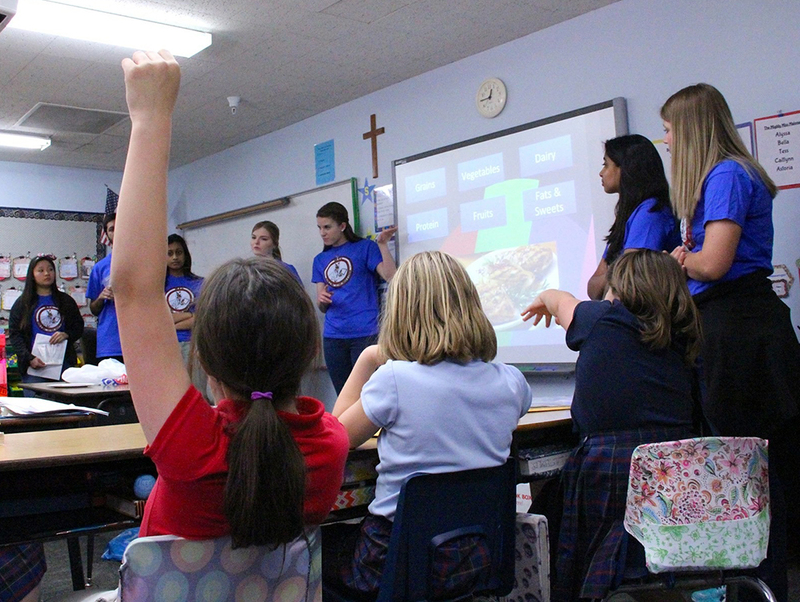 Members of the Roos on Call student service organization lead a group of fourth and fifth graders at Calvary Lutheran School in learning about the food pyramid. It doesn’t take long for medical students working in the outpatient clinics of Truman Medical Center to see the consequences of unhealthy lifestyles. Poor nutrition and obesity are far too common culprits. Kayla Briggs, far right, and Logan Burrow, members of Roos on Call, talk with children about the Fit for Life program. That’s why Kayla Briggs, a fifth-year student, and her student community service group, Roos on Call, are doing something to make a difference. Combining interests in curriculum development and children’s health, Briggs and her organization launched a month-long lesson plan for elementary school children called Fit for Life. Roos on Call is teaming up with teachers at Calvary Lutheran School to present lessons on healthy lifestyles to 38 fourth and fifth graders. Marjorie Farrington, left, and Josh Gollub performed a short skit on opening day of the Fit for Life program at Calvary Lutheran School. Briggs, who started Roos on Call a few years ago, created the curriculum with the help of David Skoglund, M.D., a pediatrics resident at Children’s Mercy. Skoglund developed a similar program when he was a medical student at Creighton. He shared his curriculum with Briggs and third-year student Danielle Graves, who tailored the program to fit the Calvary Lutheran students. A kickoff program had nearly a dozen School of Medicine students leading small groups of the elementary students through presentations on healthy foods to eat, heart health and fun things to do to stay active. The month-long program consists of 20 lessons, following a theme for each week: setting goals and establishing healthy habits; healthy diets; exercise; and continuing healthy lifestyles through good hygiene. Students are taking turns leading six of the lessons, lasting 30 minutes to an hour each. The school’s teachers lead the remainder of the lessons each day, using materials and the curriculum supplied by Roos on Call. Briggs had plenty of help. Asma Akhtar, a fourth-year student, is the program’s co-chair. Logan Burrow, a third-year medical student, attends church at Calvary Lutheran and connected the organization with the elementary teachers. Sarah Hampl, M.D., a childhood obesity specialty at Children’s Mercy, and Roos on Call faculty sponsor Sandra Smith, have been instrumental in getting the program off the ground, Briggs said. 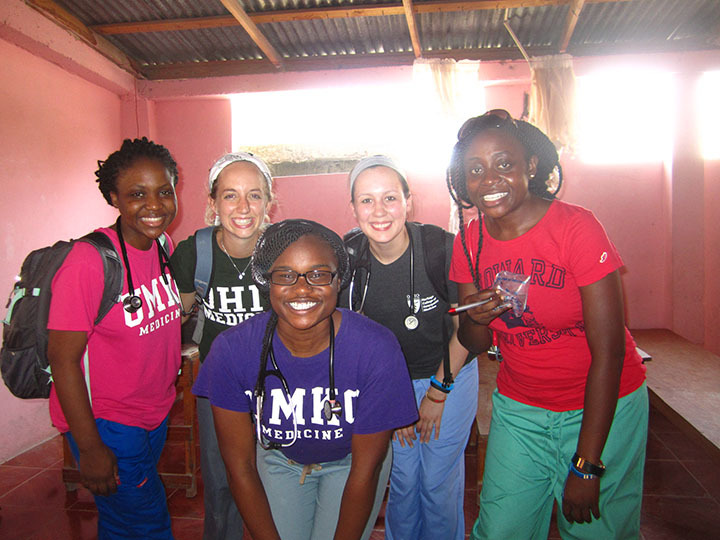 Simisola Kuye, MS 5, (left) and Nkiru Osude, MS 5, (middle) traveled to Haiti on a medical mission trip with the Student National Medical Association this past summer. Nkiru Osude, MS 5, and a team of medical students and physicians traveled to a remote area of Haiti this past summer as part of a medical mission trip. Their five-day venture included two days of mobile medical clinics in the northwest city of Gonaives. A third day was spent treating those in a secluded, mountainous region about a two-hour drive from Gonaives, where many had never seen a doctor before. “It was very interesting to be in a place where medical care isn’t experienced very often,” Osude said. Most surprising, she said, was that the medical team spent much of its time treating largely the same type of ailments as what they would typically see in this country. “We would see things like high cholesterol, normal things you’d see here,” Osude said. “But you would have to use your history-taking skills to tease out what they actually had and then see what exactly you could do for them. Osude said the biggest difference that she saw was the availability and cost of needed medications. Something as simple as a bottle of antacid in Haiti costs as much as a person there might earn in four or five days. Osude took part in a similar mission trip to Haiti through her church in 2013. She was responsible for planning this year’s trip and leading 13 other medical students, including Simisola Kuye, MS 5, also from UMKC, into Haiti. The students were from the Student National Medical Association, an organization that supports minority medical students and addresses the needs of underserved communities. Osude joined the student medical organization’s board of directors last April and was appointed to chair the group’s International Affairs Committee. A large part of her role with the SNMA has involved planning the recent trip through a partnership with the Haiti Orphan Project, the same organization that sponsored her church trip two years ago. While in Haiti, Osude reconnected with some of the people she had met when she was in the country before and said she was surprised by the reception she received. 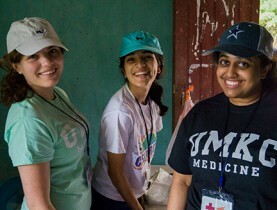 In May, a team of 28 students from UMKC School of Medicine spent a week providing medical care and community service in the northern region of Nicaragua. The volunteers were part of the Medical Brigades, an arm of the world’s largest student-led global health and sustainable development organization known as the Global Brigades. 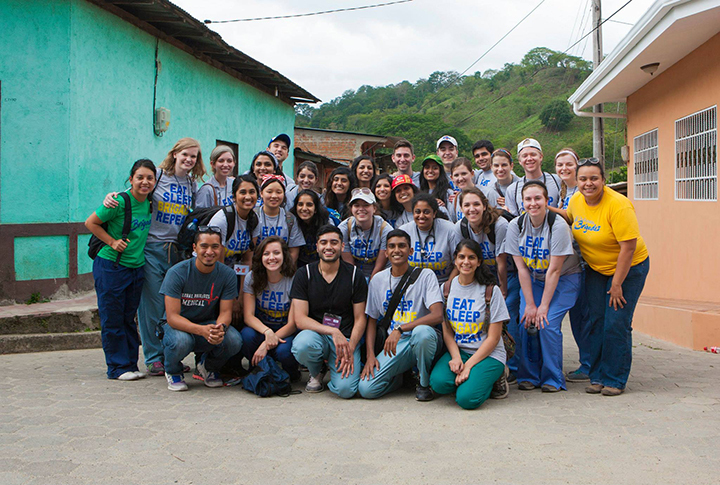 This was the third year in a row that the School of Medicine chapter of Global Brigades has taken a team to communities with limited access to health care, having traveled to regions of Honduras and Nicaragua the previous two years. Global Brigades serves Honduran and Panamanian communities by sending out a brigade every three to four months. The students, joined by three physicians, conducted health clinics in the small community of San Juan de Rio Coco, where they saw and treated 1,324 patients in three days. Two of the students, Sanju Eswaran, MS 4, and Kayla Briggs, MS 5, collaborated to keep the following daily journal of their trip. We arrived in Managua, the capital of Nicaragua, at approximately 8:30 p.m. and stayed at Hotel Mozonte overnight. We had our first introductions from the Global Brigade staff, our coordinators, Juniet and Jorge, along with a rough outline of our schedule, while eating at a Nicaraguan Pizza Hut. We played some competitive Taboo into the night before heading off to bed with a satisfactory win. Waking up in the morning around 6:30 a.m., we had the first of many breakfasts of rice, beans, and juice before heading on our six-hour bus ride from Managua to San Juan del Rio Coco, located in northern Nicaragua. We choose our buses at random, but stayed in the same location for the remainder of the trip. In the beginning, the ride to San Juan del Rio Coco was flat and mostly at a slight incline. However, the second half of the trip was rather bumpy, as we were in the center of the Cordillera Isabelia, a major mountain range. After a rather long, nauseating bus ride, we arrived in San Juan del Rio Coco. To enter the housing premises, we had to go through an extremely compact gate. In fact, if our bus had been one or two inches to the left or right, it would have scraped the yellow-cement walls. Our brigade of students and staff rent all of the rooms at Hotel El Amanecer. The rooms and bathrooms were very nice and probably the most hygienic of all the places we stayed. An hour after we were settled in, we started packing the medications for the next four hours. Sharpies, ziploc bags, and the plethora of medications were flying everywhere. Soon after, we were efficient robots of medical labeling. We ended the night with dinner and instructions for the next day — our first day of clinic. Kayla Briggs, MS 5, working in the clinic. The first two days of clinic were in the same location. There were three main stations during clinic: triage, pharmacy, and Charla (health education). We also got the opportunity to watch dental cleanings and crude tooth extractions with a dentist and helped an Ob-Gyn with women’s health and pelvic exams. Initially in triage, our Spanish was very minimal but we picked up words quickly throughout the day. Fortunately, we had an official translator, Marvin, along with the other staff members, to help translate the more difficult chronic and acute conditions the patients had. We checked blood pressures, temperatures, and recounted full histories of the patients before they saw one of the three doctors. One of the most memorable times from triage was teaching the younger medical students how to take vital signs for the first time. From the doctors in clinic, the patients were given prescriptions for medications before heading down to the pharmacy. The pharmacy was a whole other story. After organizing the medications in the pharmacy (a converted classroom), we were handed dozens of prescriptions at a time. Unfortunately, we were not able to read any of the doctors’ handwriting. It took some special, rare talent to do so. However, as the day progressed, we were slowly able to figure out the handwriting and had a system of getting the medications efficiently to the patients. Thankfully, we had an extremely nice pharmacist, Mila, who helped us every step of the way to give the patients the medications they needed. At the end of our first day of clinic, we had seen 394 patients from rural San Juan del Rio Coco. After returning from clinic, we had local Nicaraguan ice cream across the street from our living quarters, which was a perfect celebration following a day of hard work. That night, we relaxed and played a few games of Taboo and Signals. We also had a discussion about how to improve the efficiency in clinic the following day before heading off to sleep. Sanju Esaran, MS 4, Komal Kumar, MS 2, and Sarah Atallah, MS 2, take a break while working in the pharmacy. We were in the same location as the first day of clinic. This day, we experienced the third part of clinic day, which was Charla. Playing with the kids, handing out toothbrushes, and learning the “Cepillar Cepillar” song was a blast. The song was designed to teach the kids oral hygiene and how to brush appropriately to avoid cavities, which are treated in Nicaragua much differently from the United States. Thankfully, in the U.S., we are able to have fillings, crowns, and root canals by our dentists. In Nicaragua, the only treatment for cavities is a tooth extraction. That same day, I was able to assist the dentist with several tooth extractions. The dentist would inject a syringe of lidocaine into the patient’s mouth, and forcefully use her metal tools to yank the teeth out of both the young and the old. Seeing a kid tear up silently in the dentist’s chair while getting an extraction with his friends nearby pointing and talking was so heartbreaking. While wrapping up clinic and packing the medications, some of the local people of the small town called us over to the school house. They performed several songs and gave speeches in appreciation for helping them. The “thank yous” we heard were unforgettable and genuine. We had a night full of more competitive games, including Pictionary, into the wee hours of the night before our last clinic day. 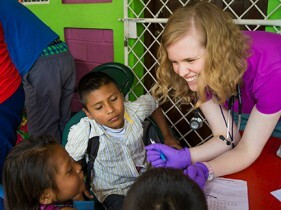 Shannon Kilfoy, MS 2, works with local children during Charla, a time of teaching health education. Today, we held clinic in a new location, a more “suburban” San Juan del Rio Coco. The clinic we were in was absolutely gorgeous. It was in a two-story building with stainless steel steps, nice toilets, newly painted colorful walls, and the most breathtaking views of the mountains. 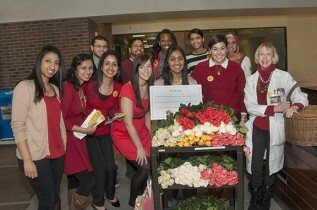 We were happy to say that we broke the UMKC record for the most patients seen in clinic. By the end of the day, it totaled 1,324 patients in three days, 80 more than in 2014. We reached our new compound, which definitely wasn’t the best. We were in an old convent with no sealed windows (we sprayed bug spray around our window multiple times a day) and poorly maintained bathrooms. The girls were in one big room subdivided into smaller rooms, fitting three beds each. The walls don’t go up all the way, so conversations carried. You have to be quiet early in the morning because everyone knows what everyone is doing at all times. Unfortunately, the showers were also ice cold, which only made us all bond more. We ended the night rather early to prepare for our first day of Public Health. First day (of three) of public health. 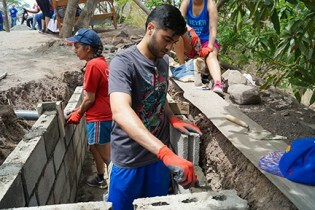 We learned that our project would be laying concrete floors and building an outdoor wash/toilet/shower station at our work site, which had two different houses. We worked with local masons who receive $100 from each of our brigades payments for supplies and salary. One house was getting an outer sidewalk to the restroom wash station. The second house was getting concrete floors in the whole house, (three rooms) and a similar wash station. Additionally, both houses got underground septic tanks that can hold enough waste for 20 years. Our brigade is a little different than other years; we only have five boys on the trip out of 28 people. When we distributed jobs, we were in the group that mixed concrete, which is made with sand (moist, fine, dark dirt that’s purchased), rocks, and quick set cement. Mixing is done by hand with shovels. So yes, we spent six hours in the blazing Nicaraguan sun, hand mixing concrete. Our batches were large – most contained four wheelbarrows worth of sand, two large bags of rocks, and two bags of concrete. We mixed the dry ingredients until everything was uniform, added and mixed in well water (which you have to carry in buckets by hand) until it was like cake batter. By far, this was the hardest, most labor-intensive job. Juniet, said we were so efficient that we would finish building by the next day, leaving the third to enjoy ourselves. This gave us motivation for Day 2. We dressed up and went into town tonight for ice cream and to shop. Pistachio ice cream was delicious. The chain ice cream shop is called Eskimo (pronounced “s-KEY-mo” here). The stores in downtown Matagalpa are really nice. Things are so cheap here, too; fake ray bans were only $2. Our big event that night was salsa dance lessons at the compound across the street, taught by another brigade coordinator. We danced, had pizza, and hung out with groups staying at the other compound. Another highlight of the trip. Harris Zamir, MS 4, at work during one of the team’s public health days. Soon after breakfast we headed out to finish our Public Health projects. We found out a little bit more information about the local people that we were building for. The first house was owned by an older family. The head of house was an older woman with a few family members. The second house was owned by a young family consisting of a husband, wife, and young boy (named Bryan). Wild roosters and dogs ran around everywhere along with several kids playing. We finished all of the planned projects by mid-afternoon and put our handprints and signatures on concrete slabs near the work that was completed. After signing our names, there was a small thank you ceremony in which the owners of the houses gave us their gratitude. It ended with a pinata filled with candy for the local children. With a feeling of accomplishment, we had another relaxed night filled with games before heading to bed. Having completed all the public health projects in two days, we had this day all to ourselves. We began the day with a hike. This hike was pretty much thousands of concrete steps to the top of the mountain. The view from the top of the mountain was phenomenal with a view of the city from one end and countless mountains at the other. The city was red-roofed, white-walled houses with luscious trees piled in a valley between two mountains. After our intense hike in the Nicaraguan sun, we were rewarded with the best meal of the whole trip in the city. Our plates were covered in authentic Latin American food including plantains, spiced rice, and traditionally cooked meat and beans. Following lunch, we did a little souvenir shopping in the city itself. After buying sombreros, coffee key chains, shirts, and much more, we headed back to the convent. We went to other compound until 11 p.m. and played cards, ate pizza, and danced. Knowing that our flight the next morning was to leave around 7 a.m., our buses were going to leave around 3 in the morning to reach the airport in Nicaragua. Therefore, we all packed and cleaned our rooms before playing hours and hours of mafia to end our last night together. Leaving in the morning at 3 a.m. was exhausting and it was emotional saying our good byes to Juniet and other Global Brigade staff members. After heading to the buses, we passed out in our respective seats till reaching Managua. We reached Houston early afternoon and broke our fast-food fast with Texas’s famous Whataburger hamburgers and fries and Panda Express. Houston, for us, was a travel point where all of us split up to our respective home destinations. Going to Nicaragua on this nine-day experience was a privilege, sparking our insight into healthcare resources and complications abroad. This experience definitely shapes us into becoming future gracious and appreciative physicians. Since our journey, we’ve had two “reunions” with our Brigades group. The first, a cantina night, and the other, an ice cream social. We think we speak for everyone when we say we’re incredibly grateful for the chance to travel to Nicaragua and to meet their beautiful people, but equally grateful for the lifelong friendships we’ve formed.